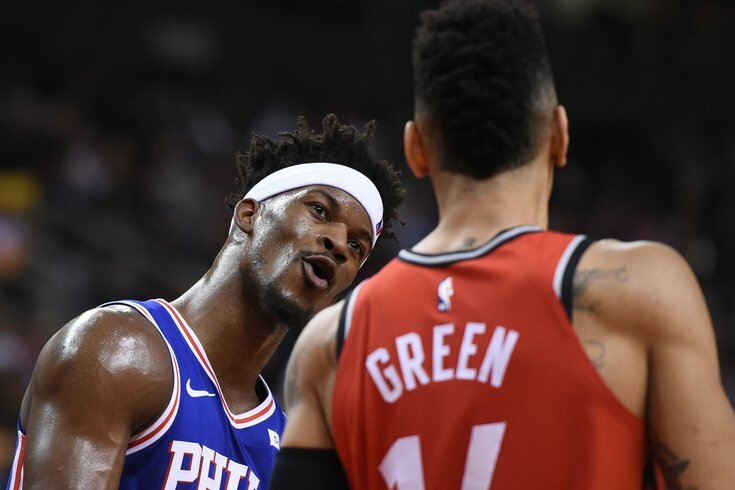 Philadelphia 76ers guard Jimmy Butler (23) speaks to Toronto Raptors guard Danny Green (14) in the first half at Scotiabank Arena. After hanging around through three quarters thanks to a Jimmy Butler scoring display, the Sixers wilted on national television and ended up with a familiar result in Toronto. The Sixers may be part of the Eastern Conference elite eventually, but the Raptors are better right now, and they showed it in a 113-102 win on Wednesday night. Here's the quick version of what I saw on Wednesday evening, featuring one of the worst Joel Embiid games you'll ever see. • The Sixers have to outplay Toronto's starters by a decent margin in order to compete with the Raptors, at least for the time being. Philadelphia's first five have been wildly good so far, but things take a turn when they need to lean on bench contributors. They didn't exactly blow Toronto out of the water in the first quarter, but the Sixers were the pacesetters in the first quarter, and they beat Toronto not with individual brilliance, but a balanced attack. Joel Embiid mixed things up inside while keeping his head up in the post, Jimmy Butler made intelligent cuts and kept the ball moving on the perimeter, and Ben Simmons did his usual jack-of-all-trades thing. This pass, by the way, was a thing of beauty. We often talk about Philly's potential in a playoff series with regards to having a ton of individual talent. But they're dangerous because they are already starting to find ways to achieve their goals together, even in their infant stages of development. A very good sign. • Furkan Korkmaz is fighting an uphill battle to be an impact defender at this level — the guy is still mostly skin and bones — but he's athletic enough to be a competent option there if his reads are on point. And lately, I think they have been for the most part, which shows some growth from the second-year wing. The Sixers have a trio of impact defenders in Embiid, Simmons, and Butler, so the rest of the guys mostly have to make sure they're not making critical mistakes. Korkmaz still has his brain fart moments, but he's turning the corner lately, and that will afford Brown another competent wing. • One thing that stands out about Landry Shamet that the ESPN broadcast crew correctly pointed out on the broadcast: he plays the same game regardless of the situation. A blowout against the Wizards or a tight battle with the Raptors? Doesn't really matter. He's going to hunt his shot, use some craftiness to create open windows on the perimeter, and compete defensively in spite of his limitations. The Sixers will take it because teams send plenty of attention his way on the perimeter. • Philadelphia's other two big ticket players struggled a bit on Wednesday, but the guy they went to be the final piece sure looked pretty good. Jimmy Butler was all the Sixers had going for stretches of the game, and it allowed them to hang around longer than their effort probably warranted. As the Sixers struggled to find their footing in the third quarter, it was Butler who allowed them to hang around, ducking and driving around Toronto defenders en route to a team-high 38 points against the Raptors. It honestly felt like he had even more, because none of their other stars did much of consequence offensively, and the Sixers may have lost by 30 if not for his presence. It is especially critical to have a go-to perimeter guy on a team built around a big man because when Embiid doesn't have it going, things get ugly when you try to run a ton of offense out of the post. It's an inefficient style of offense that is only credible here because Embiid is an unbelievable talent, and Butler gives them another stylistic option, to say nothing of his actual talent. Butler also kept coming in the fourth quarter after it appeared the rest of his teammates had packed it in. Say what you will about what it's like to have him around the locker room long-term, but the man is a competitor. • Give credit where it's due — the Raptors have a lot of guys who are good at timing their swipes at the ball, disrupting Philadelphia's best players when they least expect it. Being pickpocketed by Kyle Lowry or Kawhi Leonard is nothing to hang your head about. But that's what make the rest of Philadelphia's turnovers so frustrating. You know the Raptors are going to disrupt what you like to do, so you need to make sure you take care of the ball in less stressful situations. Entry passes from guys like JJ Redick need to be crisp, not half-assed, and T.J. McConnell needs to play under control in transition instead of trying to play at breakneck speed. Those plays around the margins add up. • I'm not sure what was going on with Joel Embiid on Wednesday night, but he just did not look like he really had it for most of the evening. That goes for both ends of the court because it was too easy for the Raptors to score in his paint and not nearly difficult enough to deal with him on the other end. We have discussed it before, but the minute load he has carried so far this season has to be kept in mind at all times. The schedule has lightened up, but Embiid is playing more minutes this early in the season than he has ever been asked to play and that's a definite adjustment. A rest game or two would not hurt. They need him over the long haul. Granted, he wasn't exactly getting a favorable whistle against Toronto, and with his game predicated on drawing contact and foul calls, that hurts. It also leads to him getting frustrated, and things can spiral out of control from there. But no matter what the explanation is, he has to be better to compete with teams like Toronto. • McConnell had five turnovers in the first half against Toronto. That is not going to cut it for your backup point guard in any full game, let alone in half of one. His upside is not high as it is, and his effectiveness relies on just making the simple plays. He was a long way from doing that on Wednesday. • Speaking of Simmons, he was pretty much anonymous outside of the pretty pass to Butler up top. Ineffectual on defense, passes were slightly off in the halfcourt and transition, and his box score felt more like an accumulation of numbers than anything resembling meaningful production. Just not good enough. It feels like we say this about Simmons in too many games against higher-quality opponents. Do you want to be treated like a future star? You have to make an impact in games like these. • Switches are going to happen, of course, but it felt like Butler was away from Kawhi Leonard for far too much of the evening on the defensive side of the ball. He was brought here in part because he loves the challenge of shutting down an individual matchup on the wing, and he didn't necessarily get that chance. Leonard cooked Philadelphia all night, which seems about right given the decision. Butler was shouldering a pretty heavy load on offense, so I get not wanting to wear him down completely, especially with how useless Embiid was on Wednesday. But I think you have to recognize where the game is going and respond accordingly. • As frustrating as the end to the first half must have been for Philadelphia, they were very much in striking range coming out of the halftime tunnel. And after Simmons came up with a nice steal on Toronto's opening possession, Redick promptly threw the ball away in transition, gifting it back to the Raptors. From there, Philadelphia just looked far too lifeless for my liking. Embiid was at the center of all of it and it permeated throughout the team, with the Raptors beating them to loose balls all over the court. That should not happen in this matchup in particular, with the Sixers having a hell of a lot more to prove than the Raptors do at this juncture. We often laud Embiid's spirit and drive to win, and for whatever reason, he did not have it on Wednesday. He was late or just disinterested on rotations, not all that inspired to run the floor, and he settled for a few jumpers after effort plays produced offensive rebounds that could have reset the offense. He is the team's best player, and they followed his lead. That wasn't a good thing, and the overall effort from the group was completely inexcusable after two days of rest. • I saw some fans complain about officiating on Twitter during the game, and Embiid certainly was on the wrong end of some calls. But the game and the officials tend to find energy, and he played with very little. Probably a deserved outcome.